My 1st real cable project! Wow! I just realized that I have 125 followers! I can’t believe that! Thank you to everyone who is interested in my newbie knitting adventures! So, I have just recently started a 2-color cable scarf for my father-in-law, Wim. Here is the first pic of the blue starting repeats. You may be able to see that I have just started to put the black colorway in on this shot. The pattern is beautiful, and the best of all is that it is free! I love beautifully written/designed free patterns. I chose the blue to match Wim’s eyes. He has gorgeous white hair, a square jaw, and his eyes are blue like this yarn. The 2nd color I chose was black because his winter coat is black, and these 2 colors pop and complement each other. I am using Berroco Comfort Worsted in the colorways of Licorice 9734 and Berroco Vintage in colorway 5178-Violetta. 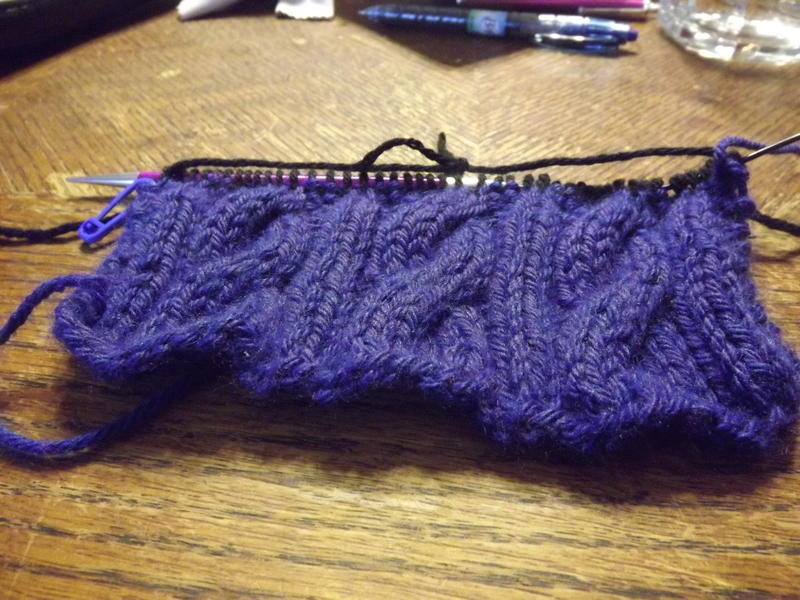 I know that would make one think this is a purple yarn, but looking at it right now, it is so blue.. I can see tiny bits of purple in it but the bits are so tiny that the blue takes over and dominates this colorway. It is just gorgeous no matter how I turn it in the light. The yarn links below are for Vintage and Comfort respectively. I love working with the 2 different yarns for this project. They have the same gauge on a size 9 needle, which is 4 stitches per inch. Gauge wasn’t critical for this project, so I just checked it for my peace of mind. I am using my Signature size 9 circulars in an effort to use the needles, LOL.. and to see how well they work for worsted weight yarns. The pattern called for a size 8 needle, and I just wanted to make this scarf a wee bit larger without having to cast on more than the 42 stitches. I will make another blog post once I have completed the next 2 pattern repeats in black so that ya’ll can see how it looks with both colors. 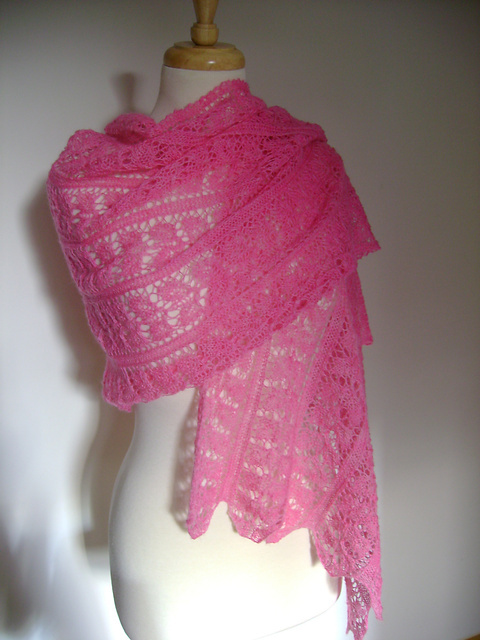 I also have this shawl on another pair of needles, but I have to find the SD card that the beginning pics are on.. This shawl is turning out gorgeous as well. Be on the lookout for a blog post about that soon! 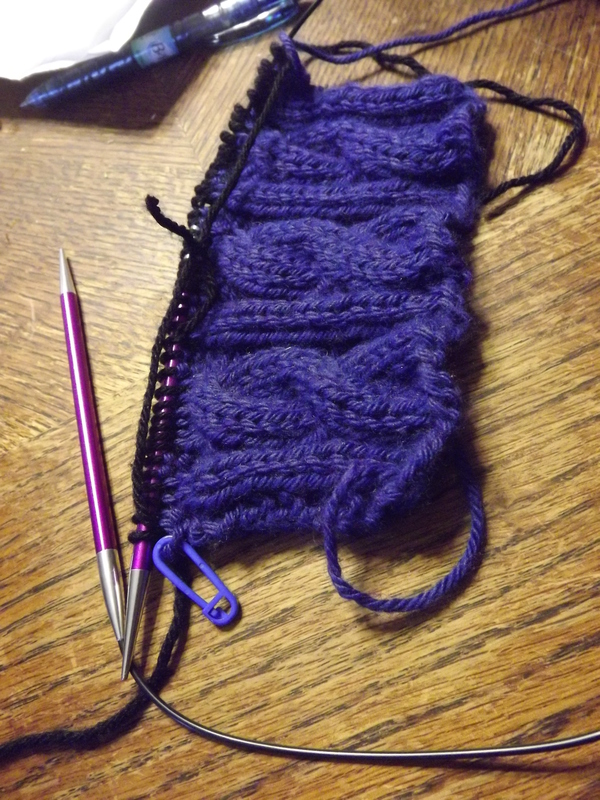 I am doing it in my mother-in-law’s favorite colorway of purple, and I am using Claudia Hand Painted yarn to do this project. It looks different depending on the lighting in the room.